By J. Charles Delbeek M.Sc. (1) and John E. Randall PhD (2) 1. Senior Biologist, California Academy of Sciences, Steinhart Aquarium 2.Professor Emeritus, Bishop Museum, Honolulu, Hawaii When it comes to keeping marine fish, hobbyists often state with pride how they have kept a fish for a year or even two years, thus labeling said fish as “easy to keep” and that they have now become excellent aquarists. While this may or may not be true it often struck us as odd that keeping a fish alive for a year was somehow considered a yardstick of success. Knowing what we did of the lifespan of fishes in the wild and the first author’s own experience in the public aquarium world where fish were often on display for decades, it seemed odd to claim that the one year mark was equated with success. The life span of fishes is believed to be related to their adult size, with small species having the shortest duration of life, as we might deduce from mammals by comparing the longevity of a shrew with that of an elephant. While this is true of fishes, in general, there are many exceptions. The Dolphinfish (Coryphaena hippurus), which reaches a length of 2.1 m and a weight of 40 kg, has a life span of only four to five years and we have found that it is possible for several goby species to live much longer than expected given their size. So how does one actually age a fish? As we have just mentioned, size doesn’t always give you a good indication, the answer lays internally by examination of the bones inside the ear (the otoliths of which there are two), generally the largest, the sagitta is used. For most fishes, a ring of calcium carbonate and fibroprotein is laid down daily in the otolith, providing a very accurate age of larvae, juveniles, and small species. As larger fish grow to maturity, the daily rings are no longer perceptible, but annular marks can be determined. They can be validated by relating them to an environmental change, particularly temperature, or from movement to water of different salinity (as by salmonids). Age determinations from otoliths have also been confirmed by rearing fish after giving an injection of oxytetracyline, which marks the ring laid down at that time, or by recovery of a tagged fish that was injected when tagged. The most serendipitous validation of the age of an otolith ring is the radioactive mark provided from the testing of thermonuclear explosions in the Pacific by the U.S. in the Marshall Islands in 1946, by the British in the Line Islands beginning in 1952, and by the French in the Tuamotu Archipelago beginning 1966. It is referred to as the bomb radioactive chronometer. One example of the use of otoliths for age determination that applies to a group of fishes familiar to aquarists was performed by Choat and Axe (1996). They estimated the age of 10 species of surgeonfishes (Acanthuridae) in eastern Australia. The annular pattern in the otolith was confirmed for four of the species by recovery of individuals that had been injected with tetracycline. Choat and Robertson (2002) continued the study on surgeonfishes and a second herbivorous fish family, the parrotfishes (Scaridae). 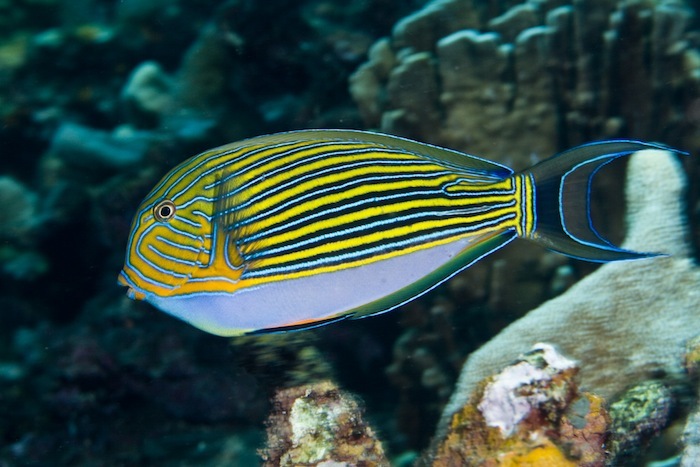 The longest life span of the 13 species of the genus Acanthurus was that of A. lineatus, 42 years; and of the genus Naso, N. annulatus, 45 years. For 19 species of scarid fishes, the Bumphead parrotfish,Bolbometopon muricatum had the longest estimated maximum age, 33 years, as might be predicted from its very large size for a parrotfish, 120 cm. 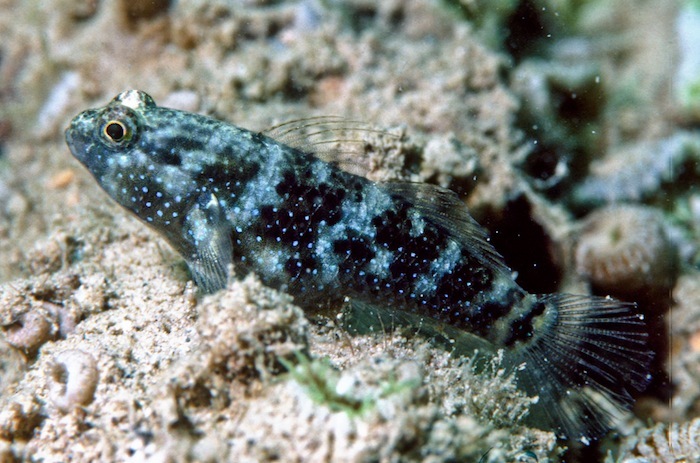 Most studies have shown that gobies have s short life spans such as Silhouettea aegyptia in the Red Sea, less than two years (Miller and Fouda, 1986);Eucyclogobius newberryi from brackish water of California, one year (Swift et al., 1989); Pomatoscistus minutus and P. microps from the Tagus Estuary in Portugal, 26 and 32 months, respectively (Moreira et al., 1991; Gobiosoma bosci in the Gulf of Mexico, about 13 months (Conn and Bechler, 1996); Aphia minuta in the Mediterranean Sea, 7 to 8 months (Iglesias et al., 1997); Pomatoschistus marmoratus in the Mediterranean Sea, 17 months (Mazzoldi and Rasotto, 2001); and Istigobius decoratus in lagoons of the Great Barrier Reef, 22 months (Kritzer, 2002). Hernaman and Munday (2005a,b) studied the age and growth of the following 5 species of gobiid fishes from Orpheus Island, Queensland: Asterropteryx semipunctata, Istigobius goldmanni, Amblygobius bynoensis, A. phalaena, andValenciennea muralis. From 134 to 162 adult individuals of each species were collected and sacrificed for age determination from reading the otoliths. The specimens of the five species ranged in total length from about 60 mm for I. goldmanni to 110 mm for A. phalaena. *The longevity of Asterropteryx semipunctatus was the greatest, 16 months for males and 14 months for females, and that of Istigobius goldmanni the shortest, 13 months for males and 11 months for females. The females of Amblygobius phalaena and Valenciennea muralisattained slightly greater size and age than the males. The 5 species showed similar growth rates in relation to their maximum life span, with about two-thirds of their maximum size attained by half their maximum life span. The shortest life span for a vertebrate was reported by Depczynski and Bellwood (2005) for the Indo-Pacific coral-reef goby Eviota sigillata, which attains a total length of 21 mm. They collected 319 individuals from the Great Barrier Reef for otolith examination. The settlement mark showed a duration of larval life as 23–27 days. The maximum duration of life, including that in the larval stage, was 59 days. When the first author began his career at the Waikiki Aquarium in June 1995, he purchased two Gobiodon okinawae from a local tropical fish importer. They were placed in a 1300 L open system marine aquarium containing several species of live coral and other marine tropicals. This species is a simultaneous hermaphrodite and so they soon formed a breeding pair. The pair removed tissue from a small section of an acroporid coral and eggs were laid on this patch; this behaviour continued for several years. In May 2002, the pair was moved to a new, larger exhibit. One of the pair succumbed to a suspected fungal infection in October 2003 therefore another individual was added in August of 2004. The individual purchased in June of 1995 was still alive and well in the exhibit as of May of 2008, marking 13 years in captivity. Since it was impossible to know the age of the fish when it was first purchased, one cannot say with certainty the actual age of the fish other than it was at least 13 years old in 2008. This appeared quite unusual so it was at that point that this was brought to the attention of the second author. His immediate reaction was that this was indeed noteworthy as most scientists felt that small fishes such as gobies were short lived. Much of this belief comes from field studies where fish are observed over successive months and then when they disappear they are assumed to have died or have been eaten. Therefore “lifespan” is based more on survivability than actual physiology. The real question is how long CAN they live from a physiological standpoint if we remove the pressures of predation and disease? The answer may lie in our aquaria. Siganus uspi, the oldest fish at the Waikiki Aquarium, 26 years and counting. Photo: J. C. Delbeek. In the published proceedings of a colloquium on ageing in animals, Nigrelli (1961) reported the longevity of 123 species of fishes from records of the New York Aquarium. The seven longest-lived were the Bowfin (Amia calva) 30 years, Longnose Gar (Lepidosteus osseus) 30 years, Striped Bass (Roccus saxatilis) 24 years, African Lungfish (Protopterus annecteus) 23 years, Shortnose Gar (L. platosteus) 20 years, Rock Bass (Ambloplites rupestris) 18 years, and the Dog Snapper (Lutjanus jocu) 14 years. He also listed the 23 species of fishes that lived 20 years or more in other public aquaria. Of these, 11 lived 25 years or more:Acipenser ruthenus 69 years, Cyprinus carpio 38 years, Polypterus senegalus 34 years, Pimelodus stegelichi 30 years, *****e labrax 30 years, Epinephelus gigas 29 years, Marcusenius isidori 28 years, Pimelodus clarias, 27 years, Gymnothorax mordax 26 years, Doras sp. 26 years, and Ginglymostoma cirratum 25 years. Noteworthy for a gobioid fish is the 20-year, 5-month longevity of Eleotris marmoratus. When it comes to common home aquarium fishes Condé (1983) published on the current age of 77 species of coral-reef fishes of the families Chaetodontidae, Pomacanthidae, Pomacentridae, Labridae, Balistidae, and Tetraodontidae in the Nancy Aquarium as 6 to 15 years. Frakes (1993) visited the Nancy Aquarium in 1986, and again in 1992. *He determined that of the original fishes from Condé, 5 of the angelfishes, the butterflyfish Chaetodonephippium, the anemonefishAmphiprion perideraion, and the wrasse Choerodon fasciatus had lived 20–21 years, and the triggerfish Balistapus undulatus 24 years. *A Giant Grouper (Epinephelus lanceolatus) that measured 6 cm on arrival had grown to over a meter in length in 21 years. *This species is reported to attain a total length of 270 cm. While on the staff of the Waikiki Aquarium in Honolulu, the first author compiled records of the date of arrival of fishes, and current Waikiki Aquarium aquarist Norton Chan has determined those still alive that have been in the aquarium for more than 13 years (Table 1). Seven other species of fishes that may have survived 13 or more years in the aquarium cannot positively be identified from others of the same species that were acquired later. 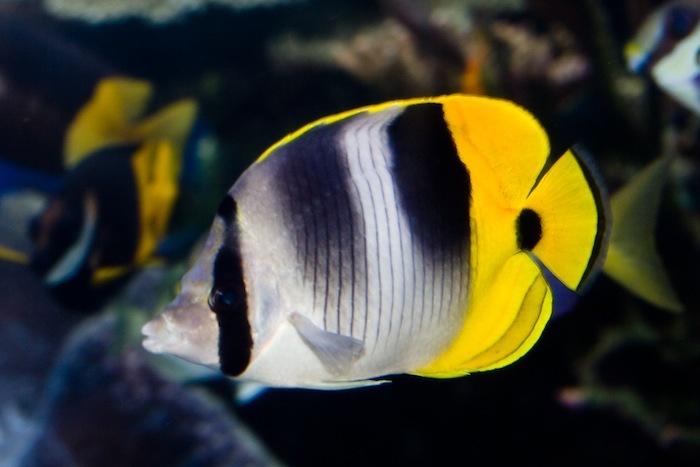 One butterflyfish of the species Chaetodon lunula arrived as an adult at the Waikiki Aquarium on September 5, 1986. It died sometime in 2008, so it had attained an age of at least 22 years and given its size upon introduction may have lived 30+ years. 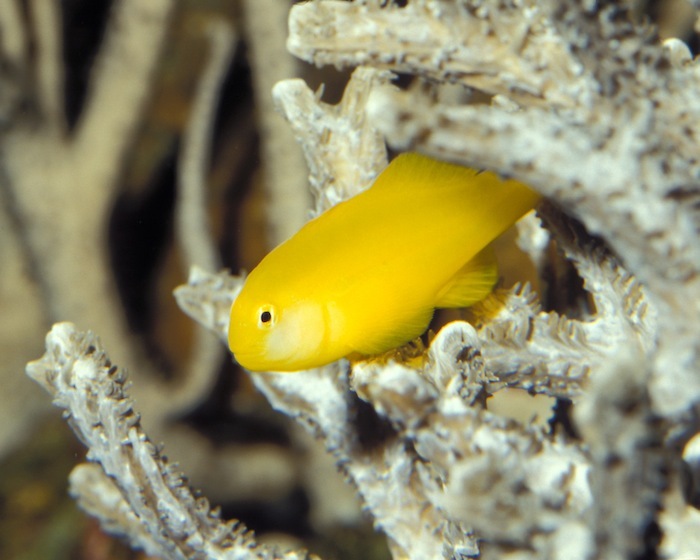 The first author has determined that some small gobies are not as short-lived as expected, based on records of their stay at the Waikiki Aquarium in Honolulu, when the threats from predators, parasites, and catastrophic environmental events in the sea are removed. The tiny fishes of the large Indo-Pacific genus Trimma can be expected to have a short duration of life, judging from the 3-months longevity of T. nasum, as reported by Winterbottom and Southcott (2008). 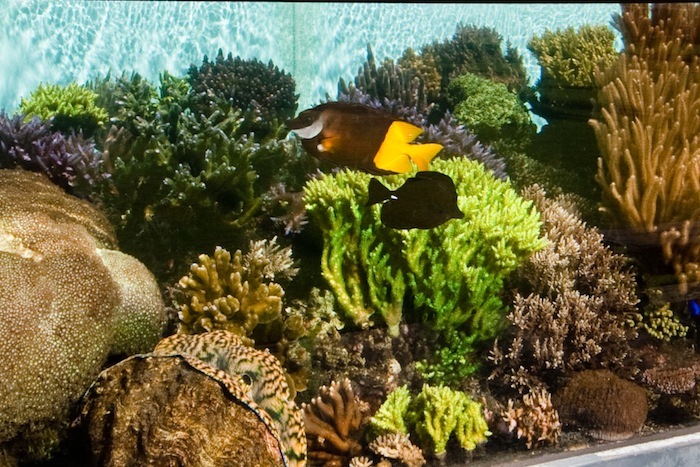 However, two species of the genus, T. rubromaculatum and T. tevegae lived from 12 to 20 months in the Waikiki Aquarium. One individual of the dwarf-goby Eviota nigriventris survived 23 ½ months, and two individuals of another Indo-Pacific coral-reef goby, Priolepis nocturna, maximum length 45 mm, are still alive at the Aquarium at the age of 3 years, 3 months. 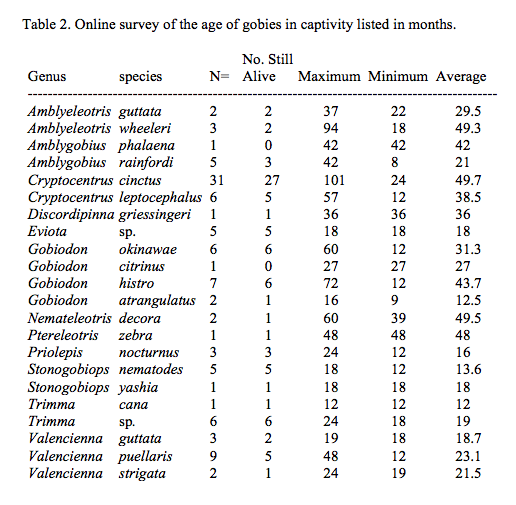 In an online survey of hobbyists by the first author, it was found that it was not unusual for gobies to still be alive in captivity for 8 or more years in the case ofCryptocentrus cinctus with many other gobiidae living more than 3 years (Table 2). Of note also was A. phalaena, which Hernaman and Munday noted lived less than 16 months, was recorded to live 42 months. It is also interesting to note that many of these fish were still alive at the time the survey was conducted. A final example of the increased longevity of a goby, when the perils of life in the wild are removed, was provided by Lisa A. Privitera (pers. comm.). She studied the reproductive behavior and ecology of Asterropteryx semipunctata in the Hawaiian Islands (Privitera, 2002). Her largest fish at the time of collection measured 46.5 mm total length for females, and 56 mm for males, therefore comparing closely to 45 and 56 mm for the same species of fish studied by Hernaman and Munday in Queensland. The age of the oldest of their 162 fish was 16 months. 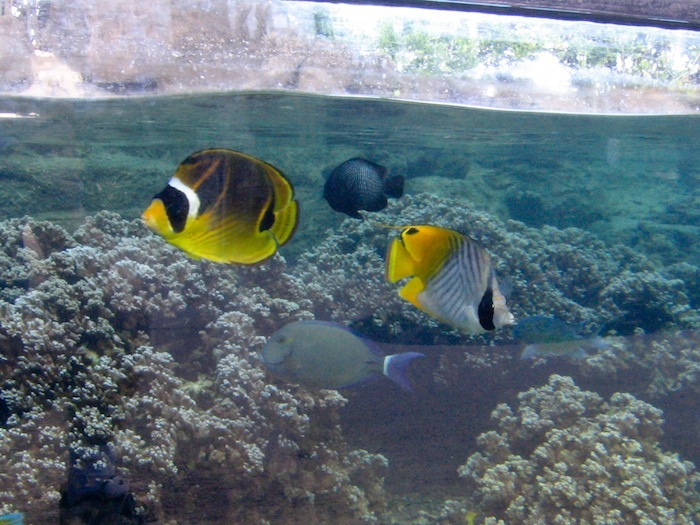 Privitera’s fish were collected in 1987 and placed in an aquarium at the Hawaii Institute of Marine Biology of the University of Hawaii. The tank was needed for another student in 1998, so her fish were at least 11 years old when released. The largest male was estimated to have grown to nearly 80 mm in total length. Asterropteryx semipunctata in the Hawaiian Islands can reach 11 years old in captivity. Photo: J.E. Randall. It would therefore seem that the age of this species reported in the wild is more a reflection of its longevity due to mortality by predation and other causes, than a lifespan due to physiology. However, the gobies that came to the Waikiki Aquarium from the aquarium fish trade were adults and did not show any obvious increase in size while in the aquarium. We therefore wonder if the short life spans attributed to some of the gobies in the literature from the examination of otoliths may have been underestimated and that these fish are capable of living much longer as evidenced by the information gained by longevity records obtained from aquarists and public aquaria. So what does this data tell us? Well for one thing, fish can and do live much longer lives in captivity than in the wild, not surprising given the absence of predators (in most cases), the unlimited amount of food available and the lack of disease. It also tells us that when compared to public aquariums, hobbyists can and should be doing better with fish such as angelfish and butterflyfish than is often the case. The belief that keeping a fish alive for a year or two makes one a “successful” aquarist needs drastic revision, with advances in aquarium water quality maintenance, water motion, more naturalistic environments and diets, we all should and shall do better when it comes to the longevity of the fish in our care. References Choat, J.H. and L.M. Axe. 1996. Growth and longevity in acanthurid fishes; an analysis of otolith increments. Marine Ecology Progress Series 134:15–26. Choat, J.H. and D. R. Robertson. 2002. Chapter 3. Age-Base Studies. Pp. 57–80 in Coral Reef Fishes. Dynamics and Diversity in a Complex Ecosystem. Academic Press, San Diego. Condé, B. 1983. Quelqués longévitiés constatées à Nancy, (technique et biologie). Revue française d’Aquariologie 9(4):125–128. Conn, C.H. and D.L. Bechlier. 1996. Reproductive strategies in a population ofGobiosomas bosci (Osteichthyes: Gobiidae) with slow and fast maturing individuals. Gulf Research Reports 9(3):177–182. Depczynski, M. and D.R. Bellwood. 2005. Shortest recorded vertebrae lifespan found in a coral reef fish. Current Biology 15(8):288-289. Frakes, T.A. 1993. The Nancy Aquarium – Revisited. SeaScope 10:1–2. Hernaman, V. and P.L. Munday. 2005a. 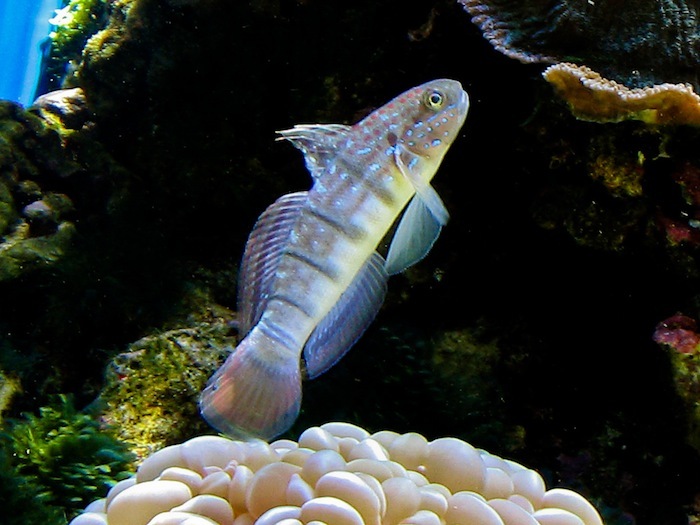 Life-history characteristics of coral reef gobies. I. Growth and life-span. Marine Ecology Progress Series 290:207–22l. Hernaman, V. and P.L. Munday. 2005b. Life-history characteristics of coral reef gobies. II. Mortality rate, mating system and timing of maturation. Marine Ecology Progress Series 290:223–237. Iglesias, M., E.B. Brothers, and B. Morales-nin. 1997. Validation of daily increment deposition in otoliths. *Age and growth determination of Aphia minuta (Pisces: Gobiidae) from the northwest Mediterranean. Marine Biology (Berlin) 129:279–287. Kritzer, J.P. 2002. Stock structure, mortality and growth in the decorated gobyIstigobiusdecoratus (Gobiidae), at Lizard Island, Great Barrier Reef. Environmental Biology of Fishes 63(2):211–216. Mazzoldi, D. and M.D. Rasotto. 2001. Extended breeding season in the marbled goby, Pomatoschistus marmoratus (Teleostei: Gobiidae), in the Venetian Lagoon. Environmental Biology of Fishes 61(2):175–183. Miller, P.J. and M.M. Fouda. 1986. Notes on the biology of a Red Sea goby. Cybium 10(4):395–409. Moreira, J.L., L. Costa, P.R. Almeida, C. Assis and M.J. Costa. 1991. Age determination in Pomatoschistus minutus (Pallas) and Pomatoschistus microps(Krøyer) (Pisces: Gobiidae) from the upper Tagus estuary, Portugal). Jour. Fish Biol. 39:433–440. Nigrelli, R. 1961. Longevity of fishes in captivity, with special reference to those kept in the New York Aquarium. Ciba Foundation Colloquia on Ageing, vol. 5: 212–230. Privitera, L.A. 2002. Reproductive biology of the coral-reef goby, Asterropteryx semipunctata, in Kaneohe Bay, Hawaii. Environmental Biology of Fishes 65:289–310. Winterbottom, R. and L. Southcott. 2008. Short lifespan and high mortality in the western Pacific coral reef goby Trimma nasa. Marine Ecology Progress Series 368: 203–208. Left, Centropyge potteri – 14 years at the Waikiki Aquarium. Right, Centropyge flavissima at the Waikiki Aquarium, 19 years and counting.